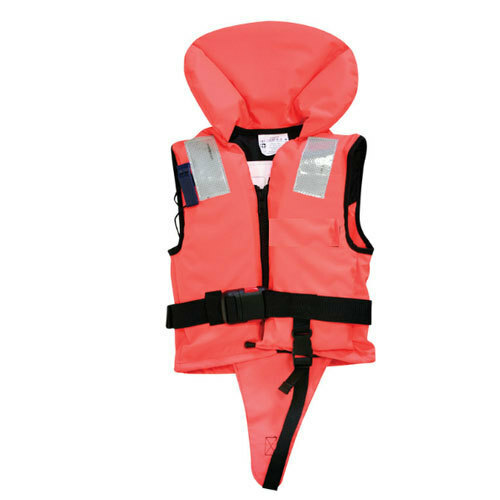 Banking on the skills of our qualified team of professionals, we are instrumental in offering a supreme quality range of Advanced Folding Life Jacket. Specifically manufactured to be easily stored, while fully complient with the requirements of the regulations (IMO Regulations), which are mandatory for all lifejackets used on-board Community ships. It is appropriate for passengers with chest size up to 175cm, oversize passengers, while is provided with lifting loop and yellow buddy line for easier rescue. This life jacket is ideal for storing underneath the seat, as it can be easily folded. Further it is recommended to combine the jacket with the compatable LALIZAS Lifejacket Light. “S. V. Industrial & Marine Services” is a Sole Proprietorship based entity, which is vastly renowned for its outstanding array of varied merchandises. Our company was incorporated in the year 2008 at Harbour Road, Visakhapatnam, Andhra Pradesh. We are retailing extremely reliable products. The assortment of products in which we deal includes Life Saving Appliance, Life Jackets, Fire Fighting Appliances, General Equipment, Navigational Equipments, Life Saving Boats and more. SVIMS do not give up, but exhibits the courage to accept responsibilities; we specialize in our focused areas of operations and earnestly strive to continuously improve our processes and our expertise to serve our customers to their fullest satisfaction by taking the right decisions at the right time. SVIMS is having the resources like experienced group of engineers at field level, Test Equipment, Port Registrations, statutory licenses etc., to meet / executive the customer demands time to time. On request we are in a position to provide sales & service of LSA items, ITU publications and navigational charts. For your kind information SVIMS is an authorized dealer and distributor for SAMYUNG ENC. Korea for Communication and Navigational equipments and for SALVO brand IRS APPROVED Fire Extinguishers & Gunmetal fittings. SVIMS keeps the stocks of Communication, Navigational, GMDSS electronic equipments, LSA, FFA Eqpts to meet the customer requirements instantly.